USES: Digoxin is used to treat heart failure, usually along with other medications. It is also used to treat a certain type of irregular heartbeat (chronic atrial fibrillation). Treating heart failure may help maintain your ability to walk and exercise and may improve the strength of your heart. Treating an irregular heartbeat can decrease the risk for blood clots, an effect that may reduce your risk for a heart attack or stroke. 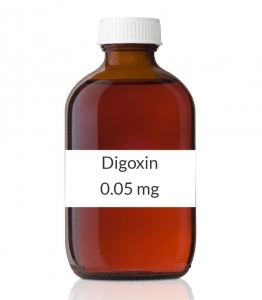 Digoxin belongs to a class of medications called cardiac glycosides. It works by affecting certain minerals (sodium and potassium) inside heart cells. This reduces strain on the heart and helps it maintain a normal, steady, and strong heartbeat. HOW TO USE: Take this medication by mouth with or without food, usually once daily or as directed by your doctor. If you are using the liquid form of this medication, carefully measure the dose using the dropper provided by the manufacturer. Do not use a household spoon because you may not get the correct dose. Your body may not absorb this drug as well if you also eat foods that are high in fiber or if you take certain medications. Therefore, take this medication at least 2 hours before or after eating food products that are high in fiber (such as bran). If you are also taking cholestyramine, colestipol, or psyllium, wait at least 2 hours after taking your digoxin dose before taking any of these products. If you are taking antacids, kaolin-pectin, milk of magnesia, metoclopramide, sulfasalazine, or aminosalicylic acid, take them as far apart from your digoxin dose as possible. Ask your pharmacist if you are not sure when to take any of your medications. The dosage of this medication is based on your medical condition, age, body weight, and response to treatment. Use this medication regularly to get the most benefit from it. To help you remember, use it at the same time each day. Do not stop taking this medication without consulting your doctor. Some conditions may become worse when the drug is suddenly stopped. Tell your doctor if your condition does not improve or if it worsens. SIDE EFFECTS: Nausea, vomiting, headache, loss of appetite, and diarrhea may occur. If any of these effects persist or worsen, tell your doctor or pharmacist promptly. Remember that your doctor has prescribed this medication because he or she has judged that the benefit to you is greater than the risk of side effects. Many people using this medication do not have serious side effects. Tell your doctor immediately if any of these unlikely but serious side effects occur: weakness, mental/mood changes, vision changes (such as blurred or yellow/green vision), enlarged/tender breasts in men. Though this medication is used to treat a certain type of irregular heartbeat, it may infrequently cause other types of irregular heartbeats. Tell your doctor immediately if you notice any unusually fast/slow/irregular heartbeat. A very serious allergic reaction to this drug is rare. However, seek immediate medical attention if you notice any symptoms of a serious allergic reaction, including: rash, itching/swelling (especially of the face/tongue/throat), severe dizziness, trouble breathing. This is not a complete list of possible side effects. If you notice other effects not listed above, contact your doctor or pharmacist. In the US - Call your doctor for medical advice about side effects. You may report side effects to FDA at 1-800-FDA-1088. In Canada - Call your doctor for medical advice about side effects. You may report side effects to Health Canada at 1-866-234-2345. PRECAUTIONS: Before taking digoxin, tell your doctor or pharmacist if you are allergic to it; or to similar drugs (such as digitoxin); or if you have any other allergies. This product may contain inactive ingredients, which can cause allergic reactions or other problems. Talk to your pharmacist for more details. Before using this medication, tell your doctor or pharmacist your medical history, especially of: kidney problems, thyroid problems (underactive or overactive). The balance of certain natural minerals in your blood (calcium, magnesium, potassium) can affect how this drug works in your body. Certain drugs such as "water pills" (diuretics) may affect the normal balance of these minerals. Tell your doctor or pharmacist if you are taking a "water pill" or if you have a history of mineral imbalance. Ask your doctor or pharmacist whether you should take a nutritional supplement or follow a special diet. Before having surgery or certain procedures on your heart (such as electrical cardioversion), tell your doctor or dentist that you are using this medication. Infants and children may be more sensitive to the effects of this drug, especially the effects on the heartbeat. During pregnancy, this medication should be used only when clearly needed. Discuss the risks and benefits with your doctor. Digoxin passes into breast milk. While there have been no reports of harm to nursing infants, consult your doctor before breast-feeding. DRUG INTERACTIONS: See also How to Use section. Your doctor or pharmacist may already be aware of any possible drug interactions and may be monitoring you for them. Do not start, stop, or change the dosage of any medicine before checking with your doctor or pharmacist first. Before using this medication, tell your doctor or pharmacist of all prescription and nonprescription/herbal products you may use. Other medications can affect the removal of digoxin from your body, which may affect how digoxin works. Examples include amiodarone, azole antifungals (such as itraconazole, ketoconazole), cyclosporine, lapatinib, macrolide antibiotics (such as clarithromycin, erythromycin), propafenone, ranolazine, rifampin, St. John's wort, among others. Check the labels on all your medicines (such as cough-and-cold products, diet aids, or NSAIDs such as ibuprofen, naproxen) because they may contain ingredients that could worsen your heart failure. Ask your pharmacist for more details. This document does not contain all possible interactions. Therefore, before using this product, tell your doctor or pharmacist of all the products you use. Keep a list of all your medications with you, and share the list with your doctor and pharmacist. OVERDOSE: If overdose is suspected, stop taking this medication and contact your local poison control center or emergency room immediately. US residents can call the US National Poison Hotline at 1-800-222-1222. Canada residents can call a provincial poison control center. Symptoms of overdose may include: severe nausea/vomiting/diarrhea, dizziness, fainting, very fast/slow/irregular heartbeat. NOTES: Do not share this medication with others. Laboratory and/or medical tests (such as digoxin levels, mineral levels in the blood, kidney function tests, electrocardiograms) should be performed periodically to monitor your progress or check for side effects. Keep all regular medical and laboratory appointments. Learn how to check your pulse, and share the results with your doctor. Consult your doctor for more details. MISSED DOSE: If you miss a dose, take it as soon as you remember if it is within 12 hours of your scheduled dose. If it is more than 12 hours after your scheduled dose, skip the missed dose and resume your usual dosing schedule. Do not double the dose to catch up. If you miss more than 2 doses in a row, call your doctor to get a new dosing schedule.